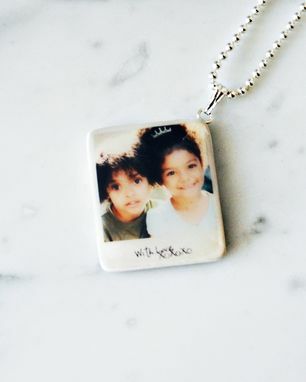 This pendant features your own picture that I've transformed into a Polaroid. Both front and back are customized with a date, name, quote... anything you like written down with a hand calligraphy font just like old style polaroids! 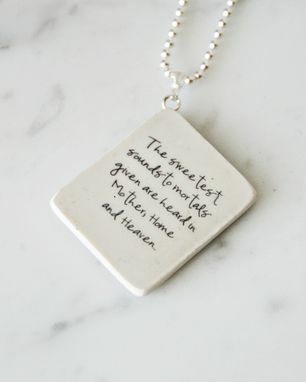 All "Portrait Tile" items are strong and lightweight. Each piece is anti-tarnish treated before your images are applied. We use a non-acrylic, acid free mixture to permanently seal your image onto the piece. Your images are not glued onto the tile, they are part of the tile. They are water resistant, scratch resistant, ultra hard, and assembled with only the finest .925 Sterling Silver components.